A rain-free, sunny Saturday beckoned us outdoors. With the lure of an Environmental Education Fair offering kid-focused activities, music, crafts and a chance to touch wild and creepy crawlies, the kids were excited to venture to The Arboretum. Turns out we didn’t need all the extras to thoroughly enjoy ourselves. I had worried that my kids would be bored looking at plants and flowers all morning. That they’d need some extra fun to make the trip worth it. Truth is, my kids like plants and flowers. And so long as mom and dad were enjoying themselves, there were no complaints. Except when it was time to leave, of course! 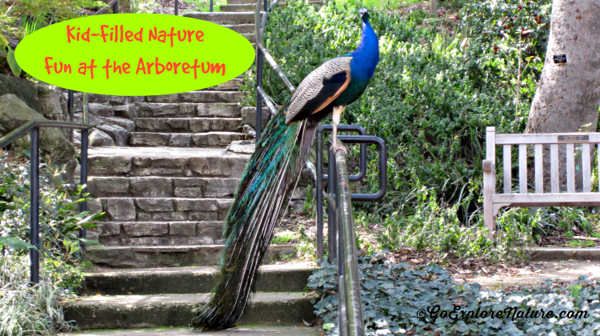 The Arboretum is a 127-acre botanical garden with something for everyone. Sure, there are plenty of beautiful plants and flowers to see. But there’s also a waterfall, a lake, a pond, several grassy lawns begging to run (or roll) on – even a very enormous willow sculpture that you can actually play in. And then there is the wildlife. 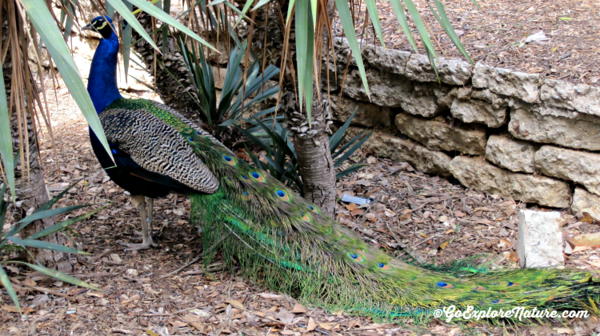 Within a few steps of entering the grounds, we came upon one of the most popular creatures that’s taken up residence here: the peacock. These guys are all over the place – some resting, some displaying their plumage, some bellowing their unique call. They’re a big hit with kids of all ages. But there are other creatures that call this place home, too, including resident and migratory birds, ducks, turtles and fish to name just a few that we saw during our visit. We started our tour of the grounds at the Environmental Education Fair set up not too far from the entrance. The kids collected stickers and touched snakes, lizards, spiders and other wild animals brought to The Arboretum by various local nature and environmental organizations. But the event didn’t hold their attention as long as I though it would; the oldest was eager to head off exploring the grounds. He decided he wanted to play follow the leader – provided he was the leader, of course. We started by choosing a destination – the Meyberg Waterfall – then slowly making our way through the grounds in that direction. Of course, we had to check out everything along the way! The Arboretum is divided into sections based on parts of the world – Australia, Africa and Asia. The result is that you get to see a wide variety of garden life within a fairly compact space. The 5 year old especially enjoyed trying to fish at Baldwin Lake, and trying to get as close to the ducks as he had at Kenneth Hahn State Recreation Area (unfortunately, these guys were much quicker!). The hubby and I loved the tropical forest we walked through to get to the lake. Once inside, it was easy to feel like you’d been transported out of Los Angeles and into the forest. From the lake, we headed to the “Catawampus,” an enormous willow sculpture. It’s the perfect size for little ones to explore and the boys loved chasing each other around inside – meeting other little ones in the process. The waterfall wasn’t much farther and was well worth the walk. There’s even a staircase leading to the top, which my oldest scaled with dad before we called it a day. If you have a little one, bring a stroller. Our 22 month old walked plenty, but needed rest breaks, too. Heck, by the end of our 2-hour visit, the 5 year old wanted a free ride, too! Let the kids play tour guide. My oldest was excited to be the leader and to “show” us what he discovered. Ask your kids to search for certain colors, flowers, plants or animals. My oldest engages much more when he has his very own task. Enjoy the water. When we visit again, I’ll allow more time to spend by the lake and pond, which were big hits with both the kids. Dawn, I was surprised how much fun my kids had. 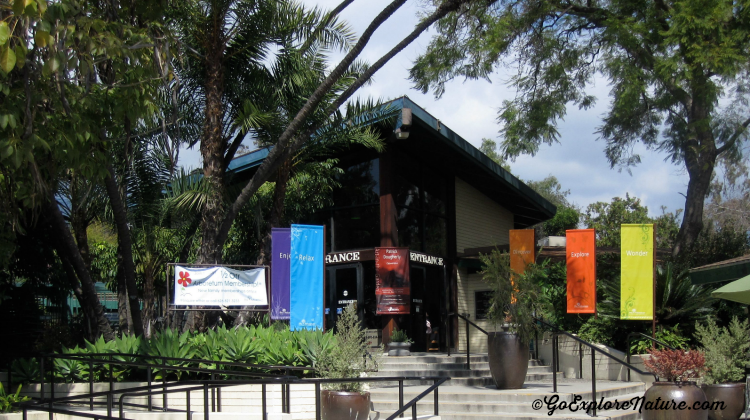 It is a wonderful place to spend a nice spring or fall morning (I think I&#39;d want to avoid the heat of California summers!). The willow sculpture looks very cool! What a great spot for the kids to explore. I am putting it on my list for a return to Cali one of these days! Thanks for sharing! Jana, thanks for stopping by! Wow, this looks like a lot of fun. My sister had taken her daughter there once about a year ago and they loved it and have wanted to go back. This is something we&#39;ll have to add to our list. You have a good eye, Sarah! The &quot;Catawampus&quot; was created by Patrick Dougherty, the artist who made the one you saw in Kansas. Now that&#39;s cool! That willow sculpture looks very similar to something I saw in Lawrence, Kansas. Here are some pictures: http://wanderingoff.com/?s=eco+art+on+foggy+day I wonder if they were made by the same artist?<br /><br />Looks like you had a great time at the Arboretum!